This is taylorshaw.net. 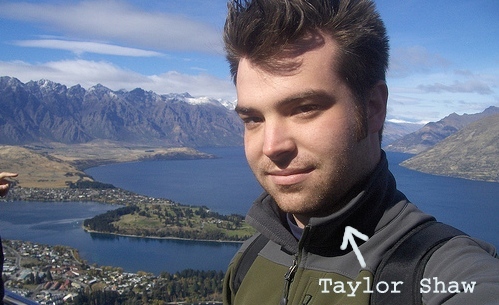 It is a world-wide-website for Taylor Shaw, who is a pretty decent guy, all things considered. It is not the website for Taylor Shaw Financial or for Taylor & Shaw Osteopaths. It is not a site for Solomon Taylor & Shaw Solicitors or for Taylor Shaw Flow Technology, even though Taylor Shaw thinks “Taylor Shaw Flow Technology” would be an awesome name for his first hiphop album. It is also not a website for those domain-name hogging caterers at taylorshaw.com. Nor is it a website for Jeannie Taylor-Shaw, Sacramento real-estate agent Shaw Taylor, acclaimed singer-songwriter Joanne Shaw-Taylor, or Cockeysville psychiatrist Dr Ruth Shaw Taylor. It is most certainly not a website for bridge enthusiast, war poet and UK television personality Shaw Taylor, who coincidentally died on the very day this site was first launched. Taylor Shaw is in fact more than a little suspicious that Shaw Taylor is his cosmic antithesis and arch-nemesis. Taylor Shaw does not play bridge. And though Taylor Shaw might be known for using certain hair products, taylorshaw.net is definitely not a website for the Taylor d’Shaw Hair Salon in Salt Lake City, Utah. Look at Taylor Shaw there. Smirking like he thinks he’s better than you. What a jerk. Honestly, I don’t know what you see in him. What about us at studiotaylorshaw.com- don’t we get a mention on your bout page? !